I'm not quite sure what me getting kicked in the backside is a metaphor for, but I think you'll agree it is pretty profound nonetheless. Thank you! It was a deeply personal voyage of discovery. With slapstick. I am suffering for my art! You can tell that I am a real artist because I shouted that even as I was being kicked up the behind. 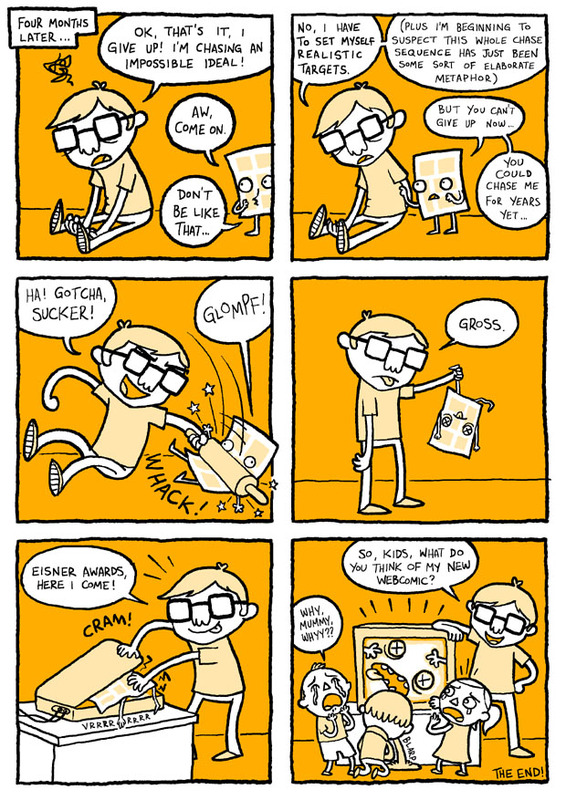 We all dream of making the comic that makes children cry and vomit. This is All Our Lives. And it's lovely! Really nice style/colour. Thank you! I figure if I only use one colour on a comic there is less chance of me making it hideous! 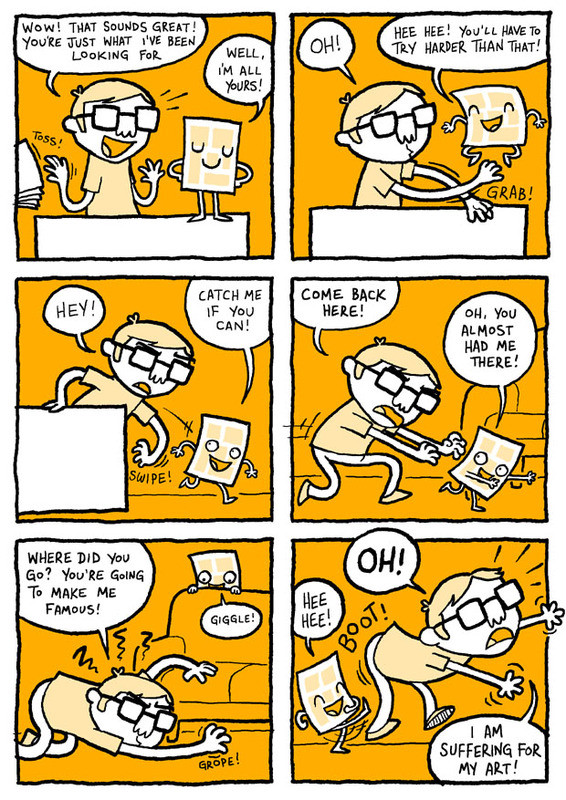 This comic is 100% solid comic gold! But I didn't make you cry or vomit? I have failed as an artist. The lesson is: always keep a rolling pin handy when you are trying to write a comic. It is no surprise that the personification of a comic is as a bug-eyed sadist. A bit like children. My favorite part was you scanning the carcass! That's only because you didn't have to wipe it down afterwards. Awesome. 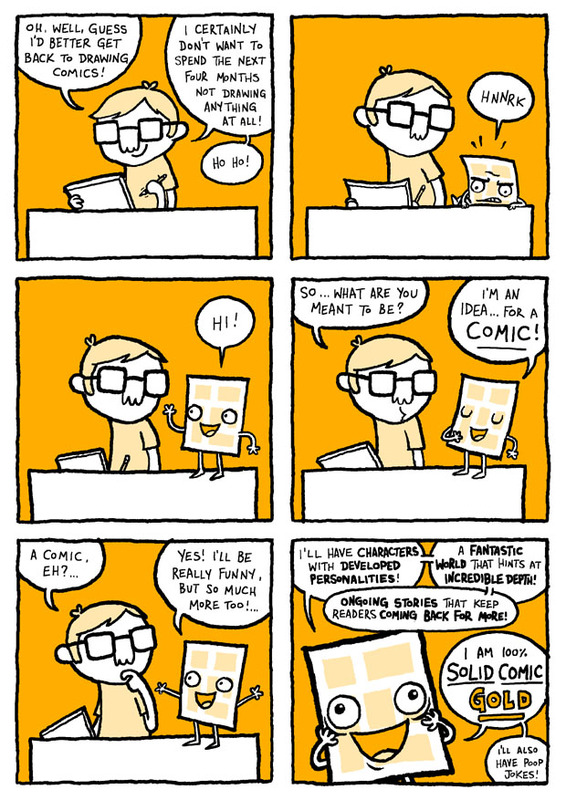 Now I know where to point people when they ask where comic authors get there ideas from. That's no comic, THAT'S MY SON! If you made a webcomic that featured nothing but the mangled corpses of comic ideas, you would be taking all of my money as I buy the trade paperbacks, the movie tie-ins and the Xbox game that come from the success of it. Is that what you want? To take all my money? Hahahahahaha! Rolling pins, like frying pans+violence=humour galore. But-- wait!! So this is your highly elaborate excuse for not doing ANY WORK AT ALL for the last four months, eh sonny? I am not fooled! I drove past your house and saw all the balloons and party streamers. You have been living it up every night eating cake, playing video games and not drawing. Haven't you?